BACKGROUND: Previous studies have shown that there were greater racial and ethnic disparities among individuals who were ineligible for medication therapy management (MTM) services than among MTM-eligible individuals before the implementation of Medicare Part D in 2006. OBJECTIVE: To determine whether the implementation of Medicare Part D in 2006 correlates to changes in racial and ethnic disparities among MTM-ineligible and MTM-eligible beneficiaries. METHODS: Data from the Medicare Current Beneficiary Survey were analyzed in this retrospective observational analysis. To examine potential racial and ethnic disparities, non-Hispanic whites were compared with non-Hispanic blacks and Hispanics. Three aspects of disparities were analyzed, including health status, health services utilization and costs, and medication utilization patterns. 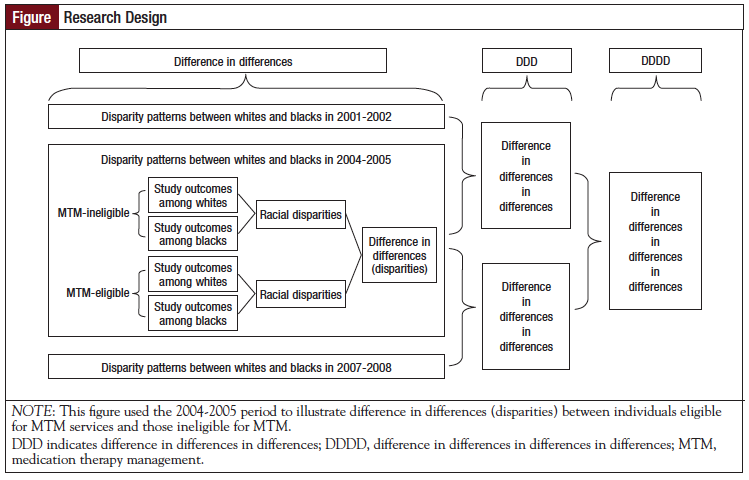 A generalized difference-in-differences analysis was used to examine the changes in difference in disparities between MTM-ineligible and MTM-eligible individuals from 2004-2005 to 2007-2008 relative to changes from 2001-2002 and 2004-2005. Various multivariate regressions were used based on the types of dependent variables. A main analysis and several sensitivity analyses were conducted to represent the ranges of MTM eligibility thresholds used by Medicare Part D plans in 2010. RESULTS: The main analysis showed that Part D implementation was not associated with reductions in greater racial and ethnic disparities among MTM-ineligible than MTM-eligible Medicare beneficiaries. The main analysis suggests that after Part D implementation, Medicare MTM eligibility criteria may not consistently improve the existing racial and ethnic disparities in health status, health services utilization and costs, and medication utilization. By contrast, several sensitivity analyses showed that Part D implementation did correlate with a significant reduction in greater racial disparities among the MTM-ineligible group than the MTM-eligible group in activities of daily living and in instrumental activities of daily living. Part D implementation may be also associated with a reduction in greater ethnic disparities among the MTM-ineligible group than the MTM-eligible groups in the costs of physician visits. CONCLUSION: Part D implementation was not associated with consistent reductions in the disparity implications of the Medicare MTM eligibility criteria. The main analysis showed that Part D implementation was not associated with a reduction in disparities associated with MTM eligibility, although several sensitivity analyses did show reductions in disparities in specific aspects. Future research should explore alternative Medicare MTM eligibility criteria to eliminate racial and ethnic disparities among the Medicare population. Furthermore, in a recent study, Wang and colleagues found that non-Hispanic blacks and Hispanics were less likely than non-Hispanic whites to report self-perceived good health status, and that there were greater racial and ethnic disparities among the MTM-ineligible than MTM-eligible beneficiary population before the implementation of Part D based on the 2006 and 2010 MTM eligibility criteria.11 This suggests that MTM eligibility criteria perpetuate the existing racial and ethnic disparities in health status. We conducted a retrospective observational analysis using data from the Medicare Current Beneficiary Survey (MCBS; study periods 2001-2002, 2004-2005, and 2007-2008).12 The MCBS, which is sponsored by CMS, includes a nationwide sample of Medicare beneficiaries linked to patients’ Medicare claims.12 This continuous, multipurpose survey provides information on Medicare beneficiaries’ health status, healthcare utilizations, health insurance coverage, and socioeconomic and demographic characteristics.12 The Electronic Orange Book Query data files (Orange Book) from the US Food and Drug Administration (FDA) were used to determine characteristics specific to prescription medications.13 These files provide comprehensive information for both brand-name and generic medications. To examine racial and ethnic disparities, 3 major groups were included—non-Hispanic whites, non-Hispanic blacks, and Hispanics. Racial disparities were examined by comparing whites and blacks, and ethnic disparities were examined by comparing whites and Hispanics. To reduce the heterogeneity of the study population, the sample included only home-dwelling Medicare beneficiaries who were eligible for Medicare based on their age. Beneficiaries in a health maintenance organization with a closed network were excluded from the analysis, because not all claims for these individuals were included in the databases. The generic-dispensing ratio was defined as the proportion of generic prescriptions among total prescriptions.11,18 The MCBS was linked to the FDA’s Orange Book to determine if the medications prescribed were generic or brand-name agents. A pharmacist manually determined if any unmatched medications were generic agents. To determine MTM eligibility, the 2010 CMS criteria were applied.19 MTM eligibility thresholds used by Part D plans in 2010 included 2 to 8 Part D drugs (median, 5), 2 to 3 chronic conditions (median, 3), and at least $3000 in drug costs. Upper, median, and lower limits were used as representative values for the eligibility thresholds used by Part D plans based on the number of Part D drugs and chronic conditions for each beneficiary.19 The median and upper limits were the same for chronic conditions, thus 1 main analysis and 5 sensitivity analyses were conducted (3*2*1, representing the number of representative values for the thresholds based on the number of Part D drugs, number of chronic conditions, and the only drug cost threshold; 6 in total). A generalized difference-in-differences (DD) model, a difference-in-differences-in-differences-in-differences (DDDD) model was used. Specifically, differences in patterns of racial and ethnic disparities between MTM-ineligible and MTM-eligible beneficiaries between 2004-2005 and 2007-2008, relative to the changes from 2001-2002 and 2004-2005, were compared and are described in the Figure. Racial and ethnic disparities were analyzed separately in regression models (see Appendix). The functional forms of the regression models varied according to the types of dependent variables. For example, a logistic regression was used when analyzing self-perceived good health status and high-risk medication use. A negative binomial model was used for count variables, including ADLs, IADLs, number of emergency department visits, number of physician visits, and number of hospitalizations. A Poisson regression was used for the number of chronic diseases, because a negative binomial model would not converge. A generalized linear model was analyzed using log link and gamma distribution on all cost variables. An ordinary least squares regression was used for the generic-dispensing ratio. The complex sampling structure of MCBS, including primary sampling units, strata, and cross-sectional full sample weights, was accounted for in all data analyses using SAS 9.3 (SAS Institute Inc, Cary, NC) and STATA 12.0. This study was deemed exempt from further Institutional Review Board review at the lead author’s institution. The 2001-2002 study sample included a total of 15,787 (weighted to 54,259,004) Medicare beneficiaries. The sample included 13,299 whites (weighted to 45,997,416 or 84.77f%), 1408 non-Hispanic blacks (weighted to 4,489,293 or 8.27%), and 1080 Hispanics (weighted to 3,772,315 or 6.95%). 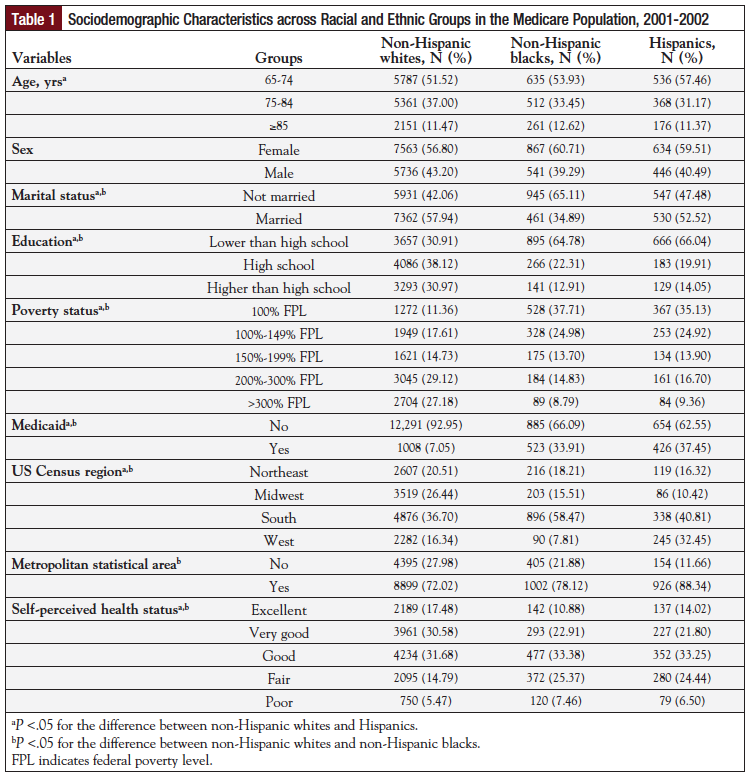 Significant differences were noted between whites and minorities on several demographic characteristics (Table 1). In comparison to whites, minorities were less likely to be married, and were more likely to have lower levels of education, belong to poorer income categories, have Medicaid, and have reported poorer health status (P <.05). The 2004-2005 and 2007-2008 samples had similar characteristics. Based on unadjusted and adjusted multivariate regression models in the DDDD part of the analyses, the main analysis (representing the combination of 5 Part D drugs, 3 chronic conditions, and $3000 in drug costs) did not find any significant DDDD (Table 2, Panel 1). However, significant findings were seen in other levels of differences and in some variables’ sensitivity analy­ses. For example, the marginal effects were higher among whites than among blacks in the model (Table 3, Panel 1). In the DD part of the analysis, the difference was calculated for the differences between whites and blacks among the MTM-ineligible and the MTM-eligible beneficiaries. 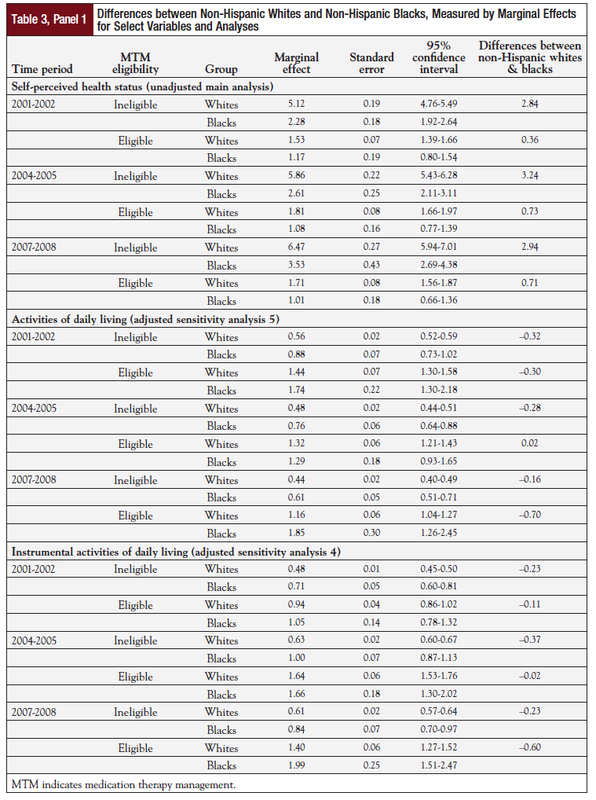 This study found significant differences for every individual time period in the unadjusted model for the self-perceived good health status, including 2001-2002 (difference in odds, 2.49; P <.001; 95% confidence interval [CI], 1.96-3.02); 2004-2005 (difference in odds, 2.51; P <.001; 95% CI, 1.77-3.25); and 2007-2008 (difference in odds, 2.24; P <.001; 95% CI, 1.17-3.3). These results suggest that racial disparities may be greater among MTM-ineligible beneficiaries than among MTM-eligible beneficiaries. Similar patterns were found in the adjusted model (Table 2, Panel 1). Nonetheless, neither the difference-in-differences­in-differences (DDD) nor the DDDD part of the analyses revealed significant findings, which indicates that Part D was not associated with significant changes in patterns of disparities (DDDD in the unadjusted model = –0.30; P = .72; 95% CI, –1.97 to 1.37; DDDD in the adjusted model = –0.56; P = .63; 95% CI, –2.82 to 1.71). The sensitivity analyses for self-perceived good health status had similar findings. For a few variables, however, when examining racial disparities, some sensitivity analyses did produce significant findings for the DDDD part of the analysis, suggesting that Part D may be associated with significant changes in disparities in some situations. Specifically, in the analysis of ADLs, only sensitivity analysis 5 (thresholds of ≥8 drugs, ≥2 chronic conditions, and >$3000 in drug costs) produced a significant DDDD estimate of 1.13 in the adjusted model (P = .03; 95% CI, 0.09-2.17). The interpretation of this estimate requires an examination of all levels of differences involved. The marginal effects were typically lower among whites than blacks (Table 3, Panel 1). 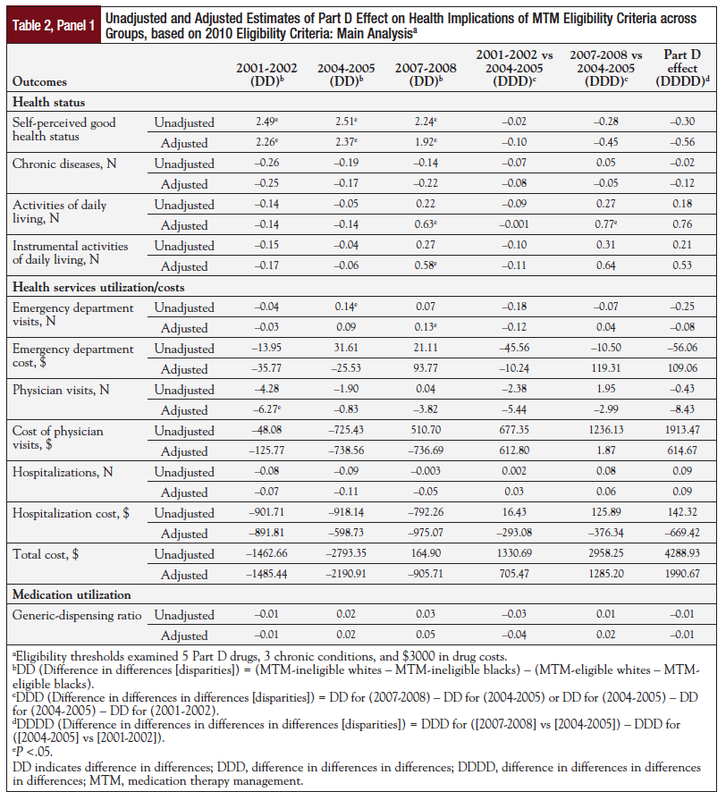 The same patterns predominantly held for 2004-2005 and 2007-2008 (Table 3, Panel 1). The DD between the MTM-ineligible group and the MTM-eligible group was –0.02 (P = .94) for 2001-2002; –0.31 for 2004-2005 (P = .09); and 0.54 (P = .09) for 2007-2008, suggesting there may not be significant difference in the abovementioned disparity patterns between the MTM-ineligible and MTM-eligible groups for any time periods examined. Furthermore, the DDD was found to be –0.29 (P = .36) for 2004-2005 versus 2001-2002 and 0.84 (P = .01) for 2007-2008 versus 2004-2005, indicating that there may be a decrease in the greater racial disparity among the MTM-ineligible than in the MTM-eligible populations when comparing 2007-2008 and 2004-2005, but there may not be significant changes when comparing 2001-2002 and 2004-2005. These findings, combined with the significant DDDD value of 1.13, suggest that Part D implementation may be associated with a decrease in any racial disparities in ADLs among the MTM-ineligible group versus the MTM-eligible group using the combinations of eligibility thresholds for sensitivity analysis 5. For the variable IADLs, the same patterns as ADLs were found in sensitivity analysis 4 (for thresholds of ≥8 drugs, ≥3 chronic conditions, and >$3000 in drug costs) and sensitivity analysis 5. This suggests that Part D implementation may be also associated with a greater decrease in any racial disparities in IADLs among the MTM-ineligible group than among the MTM-eligible group. With regard to racial disparities, no other variables were found to be associated with significant results in the DDDD part of the analysis. Concerning the comparison between whites and Hispanics, the main analysis did not find significant DDDD for any variable (Table 2, Panel 2). However, the analy­sis of costs of physician visits did show significant findings for some sensitivity analyses. For costs of physician visits, the DDDD was found to be significant in the adjusted models for sensitivity analysis 1 (thresholds of ≥2 drugs, ≥2 chronic conditions, and >$3000 in drug costs) and analysis 3 (thresholds of ≥5 drugs, ≥2 chronic conditions, and >$3000 in drug costs). The DDDD estimate was –4613.71 (P = .04; 95% CI, –8907.29 to –320.13) for sensitivity analysis 1. 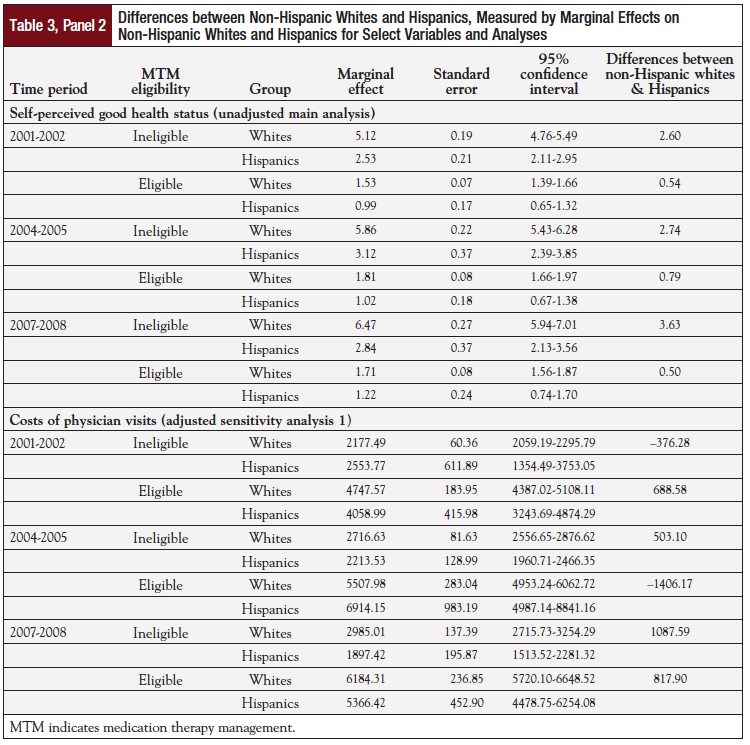 The marginal effects were quantitatively higher among whites than among Hispanics under most situations, although the CIs did not overlap for the MTM-ineligible groups in 2004-2005 and in 2007-2008 (Table 3, Panel 2). The DD estimates were –1064.86 (P = .17) for 2001-2002; 1909.27 (P = .06) for 2004-2005; and 269.69 (P = .63) for 2007-2008, suggesting that disparities between whites and Hispanics were similar between MTM-ineligible and MTM-eligible populations for all time periods. The DDD values were 2974.13 (P = .02) when comparing 2004-2005 and 2001-2002, and –1639.58 when comparing 2007-2008 and 2004-2005 (P = .15). When combined with the DDDD value of –4613.71 (P = .04), these findings suggest that Part D implementation was associated with a reduction in greater ethnic disparities in the costs of physician visits for the MTM-ineligible than for the MTM-eligible groups. Sensitivity analysis 3 had similar results, showing a DDDD estimate of –5094.36 (P = .03). No other variables were found to be associated with significant findings in the DDDD part of the analysis. This study sought to determine the effects of Part D implementation, based on the 2010 MTM eligibility criteria, on differences in racial and ethnic disparities in health status, health services utilization and costs, and medication utilization between the MTM-ineligible group and the MTM-eligible group. Although several sensitivity analyses for a few variables showed significant association between Part D implementation and MTM disparities, the results of the main analysis did not show a significant association between Part D implementation and MTM disparities. This suggests that after Part D implementation, the Medicare MTM eligibility criteria did not mitigate the majority of variables related to existing racial and ethnic disparities in health status, health services utilization and costs, and medication utilization. However, it is important to note that in some situations, Part D did correlate with a significant reduction in racial disparities, specifically among the MTM-ineligible group versus the MTM-eligible groups in relation to ADLs (sensitivity analysis 5) and IADLs (sensitivity analyses 4 and 5). Furthermore, Part D implementation also may be associated with a greater reduction in ethnic disparities, if any, among the MTM-ineligible group versus the MTM-eligible groups in the costs of physician visits (sensitivity analyses 1 and 3). However, these findings are not comforting, because the combinations of the thresholds in the sensitivity analyses were used by Part D plans less frequently than the combination of the thresholds in the main analysis. Blacks and Hispanics were also 4 times as likely to agree that generic drugs were inferior to brand-name drugs when compared with their white counterparts. However, respondents who found generic drugs comparable with brand-name drugs were 3 times more likely to use generic drug discount programs.27 The negative perceptions regarding generic drugs among minority patients likely prevent these patients from enjoying the benefits of generic prescriptions, such as decreased total out-of-pocket expenses and a reduction of cost-related barriers to medication adherence. One additional cause for the limited effects of Part D may be that blacks and Hispanics are more likely to have lower income and education levels and poorer health status, which are associated with problems related to healthcare coverage and access.28,29 Socioeconomic status is a particularly serious challenge to reducing racial and ethnic disparities in health outcomes and can also hinder the potential benefits of MTM services. For example, Cook and colleagues assessed patient behaviors after MTM services and found that poverty status was associated with participants taking less action after a medication review, even after adjusting for factors such as insurance.30 Therefore, even if MTM services are available to eligible minorities, socioeconomic factors have a substantial impact on whether health disparity patterns improve as a result of these services. Reducing disparity implications of MTM services, therefore, may have to take a multipronged approach. According to Porter, within a value-based system, good health is ultimately less costly than poor health, so the best way to contain cost may be to improve the health of the population.35 Future research should explore alternative MTM eligibility criteria that would be value-based. This study has limitations. Because of the unavailability to the research community of MTM claims databases suitable for this study, the analyses conducted were based on policy scenarios rather than on actual beneficiary enrollment data for MTM services. Similarly, disparities in MTM eligibility were examined rather than actual receipt of services. However, it is necessary to examine eligibility criteria to ensure that awareness is raised among policymakers regarding the disparity effects of these criteria. In addition, the main analysis did not show significant differences; however, several scenarios in the sensitivity analyses did find that the Part D implementation was associated with significant reduction in greater racial and ethnic disparities among the MTM-ineligible population compared with the MTM-eligible population in measures of health status, health services utilization and services, and medication utilization patterns. The results of this study indicate that the greater racial and ethnic disparities seen among the Medicare MTM-ineligible population than the MTM-eligible population in measures related to health status, health services utilization and services, and medication utilization patterns may not have been significantly reduced after the implementation of Medicare Part D. These results highlight a need for the US healthcare system to develop strategies to address these health inequalities and/or gaps between nonminority and minority Medicare beneficiaries to improve the health of the population. Future studies should explore strategies to eliminate the disparity implications related to the MTM eligibility as reflected in health status, health services utilizations and costs, and medication utilization patterns. The authors would like to acknowledge the research assistance from Kiraat D. Munshi, MS, Caroline Clark, and Yuewen Deng. 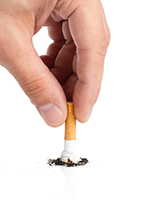 This study was funded by grant R01AG040146 from the National Institute on Aging. The content is solely the responsibility of the authors and does not necessarily represent the official views of the National Institute on Aging or the National Institutes of Health. Dr Wang has received grant support from Pfizer Inc. and from Eli Lilly and Company; Dr Dagogo-Jack has received research support from AstraZeneca, Novo Nordisk, and Boehringer-Ingelheim, and is a consultant to Merck, Novo Nordisk, and Eli Lilly and Company; Dr Cushman has received an institutional research grant from Merck and from Eli Lilly and Company; Ms Qiao, Dr Shih, Ms Jamison, Dr Spivey, Dr Li, Dr Wan, Dr White-Means, and Dr Chisholm-Burns reported no real or potential conflicts of interest. Dr Wang is Associate Professor, Department of Clinical Pharmacy, University of Tennessee College of Pharmacy, Memphis; Ms Qiao is Research Assistant, Department of Clinical Pharmacy, University of Tennessee College of Pharmacy, Memphis; Dr Shih is Associate Professor, Section of Hospital Medicine, Department of Medicine, and Director, Program in the Economics of Cancer, University of Chicago, IL; Ms Jamison is pharmacy student, University of Tennessee Health Science Center, College of Pharmacy, Memphis; Dr Spivey is Assistant Professor, Department of Clinical Pharmacy, University of Tennessee College of Pharmacy, Memphis; Dr Li is Postdoctoral Fellow, Department of Clinical Pharmacy, University of Tennessee College of Pharmacy, Memphis; Dr Wan is Professor, Department of Preventive Medicine, University of Tennessee Health Science Center, Memphis; Dr White-Means is Professor and Director, Consortium for Health Education, Economic Empowerment and Research, Department of Clinical Pharmacy, University of Tennessee College of Pharmacy, Memphis; Dr Dagogo-Jack is Mullins Professor and Director, Division of Endocrinology, Diabetes and Metabolism, and Director, Clinical Research Center, University of Tennessee Health Science Center, Memphis; Dr Cushman is Professor, Departments of Preventive Medicine, Medicine, and Physiology, University of Tennessee College of Medicine, Memphis, and Chief, Preventive Medicine Section, Veterans Affairs Medical Center, Memphis, TN; Dr Chisholm-Burns is Dean and Professor, University of Tennessee College of Pharmacy, Memphis, Knoxville, and Nashville. Centers for Medicare & Medicaid Services (CMS), HHS. Medicare program; Medicare prescription drug benefit. Final rule. Fed Regist. 2005;70:4193-4585. American Pharmacists Association, National Association of Chain Drug Stores Foundation. 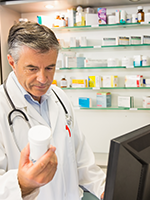 Medication Therapy Management in community pharmacy practice: core elements of an MTM service (version 1.0). J Am Pharm Assoc (2003). 2005;45: 573-579. Centers for Medicare & Medicaid Services. 2011 Medicare Part D Medication Therapy Management (MTM) programs. June 30, 2011. www.cms.gov/Medicare/Prescription-Drug-Coverage/PrescriptionDrugCovContra/downloads/mtmfactsheet 2011063011final.pdf. Accessed July 6, 2014. Briesacher B, Limcangco R, Gaskin D. Racial and ethnic disparities in prescription coverage and medication use. Health Care Financ Rev. Winter 2003-2004;25:63-76. Schore J, Brown R, Lavin B. 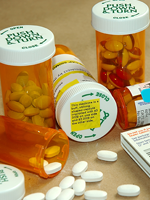 Racial disparities in prescription drug use among dually eligible beneficiaries. Health Care Financ Rev. Winter 2003-2004;25:77-90. Wang J, Noel JM, Zuckerman IH, et al. Disparities in access to essential new prescription drugs between non-Hispanic whites, non-Hispanic blacks, and Hispanic whites. Med Care Res Rev. 2006;63:742-763. Wang J, Dong Z, Hong SH, Suda KJ. A comparison of direct medical costs across racial and ethnic groups among children with cancer. Curr Med Res Opin. 2008;24: 847-858. Wang J, White-Means SI, Hufstader MA, Walker GD. The economic implications of the racial and ethnic disparities in the use of selective serotonin reuptake inhibitors. Curr Med Res Opin. 2007;23:853-863. Wang J, Zuckerman IH, Miller NA, et al. Utilizing new prescription drugs: disparities among non-Hispanic whites, non-Hispanic blacks, and Hispanic whites. Health Serv Res. 2007;42:1499-1519. Wang J, Mullins CD, Brown LM, et al. Disparity implications of Medicare eligibility criteria for medication therapy management services. Health Serv Res. 2010;45: 1061-1082. Wang J, Qiao Y, Tina Shih YC, et al. Potential health implications of racial and ethnic disparities in meeting MTM eligibility criteria. Res Social Adm Pharm. 2014; 10:106-125. Centers for Medicare & Medicaid Services. Medicare Current Beneficiary Survey (MCBS). Updated July 24, 2014. www.cms.gov/Research-Statistics-Data-and-Systems/Research/MCBS/index.html?redirect=/mcbs/. Accessed July 24, 2014. US Food and Drug Administration. Orange Book data files. Updated July 18, 2014. www.fda.gov/drugs/informationondrugs/ucm129689.htm. Accessed July 24, 2014. Andersen RM, Rice TH, Kominski GF, eds. Changing the U.S. Health Care System: Key Issues in Health Services Policy and Management. 3rd ed. San Francisco, CA: Jossey-Bass; 2007. Iezzoni LI, ed. Risk Adjustment for Measuring Healthcare Outcomes. 2nd ed. Chicago, IL: Health Administration Press; 1997. Agency for Healthcare Research and Quality. Clinical Classifications Software (CCS) for ICD-9-CM. July 2014. Updated July 29, 2014. www.hcup-us.ahrq.gov/toolssoftware/ccs/ccsfactsheet.jsp. Accessed July 6, 2014. Daniel GW, Malone DC. Characteristics of older adults who meet the annual prescription drug expenditure threshold for Medicare medication therapy management programs. J Manag Care Pharm. 2007;13:142-154. Pharmacy Quality Alliance. PQA performance measures. http://pqaalliance.org/measures/default.asp. Accessed July 6, 2014. Centers for Medicare & Medicaid Services. 2010 Medicare Part D Medication Therapy Management (MTM) programs. June 8, 2010. www.cms.gov/Medicare/ Prescription-Drug-Coverage/PrescriptionDrugCovContra/downloads/MTMFact Sheet_2010_06-2010_final.pdf. Accessed July 6, 2014. Bureau of Labor Statistics. Consumer Price Index. www.bls.gov/cpi/. Accessed July 6, 2014. Buis ML. Stata tip 87: interpretation of interactions in nonlinear models. Stata J. 2010;10:305-308. Liu FX, Alexander GC, Crawford SY, et al. The impact of Medicare Part D on out-of-pocket costs for prescription drugs, medication utilization, health resource utilization, and preference-based health utility. Health Serv Res. 2011;46:1104-1123. Afendulis CC, He Y, Zaslavsky AM, et al. The impact of Medicare Part D on hospitalization rates. Health Serv Res. 2011;46:1022-1038. Kaestner R, Khan N. Medicare Part D and its effect on the use of prescription drugs, use of other health care services and health of the elderly. The National Bureau of Economic Research Working Paper. www.nber.org/papers/w16011. Accessed September 5, 2014. Chen J, Rizzo JA, Ortega AN. 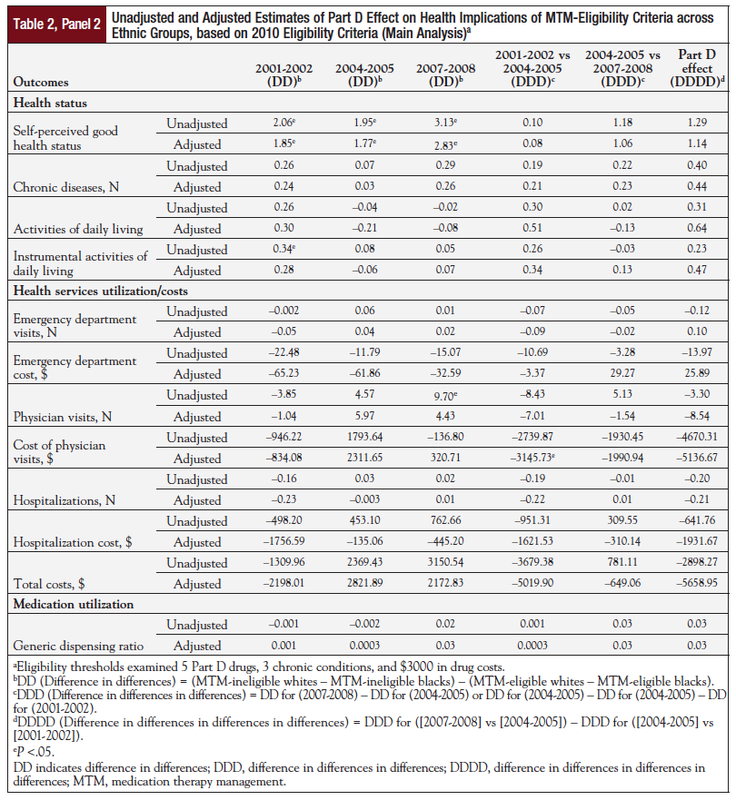 Racial and ethnic differences in drug expenditures and access under Medicare Part D. J Health Care Poor Underserved. 2011;22:1059-1074. Mahmoudi E, Jensen GA. Has Medicare Part D reduced racial/ethnic disparities in prescription drug use and spending? Health Serv Res. 2014;49:502-525. Omojasola A, Hernandez M, Sansgiry S, Jones L. Perception of generic prescription drugs and utilization of generic drug discount programs. Ethn Dis. 2012;22:479-485. Shi L. Vulnerable populations and health insurance. Med Care Res Rev. 2000;57: 110-134. Trivedi AN, Zaslavsky AM, Schneider EC, Ayanian JZ. Relationship between quality of care and racial disparities in Medicare health plans. JAMA. 2006;296:1998-2004. Cook DM, Moulton PV, Sacks TM, Yang W. Self-reported responses to medication therapy management services for older adults: analysis of a 5-year program. Res Social Adm Pharm. 2012;8:217-227. Heckler MM. Report of the Secretary’s Task Force on Black and Minority Health, Department of Health and Human Services, 1985. http://minorityhealth.hhs.gov/assets/pdf/checked/1/ANDERSON.pdf. Accessed September 5, 2014. US Department of Health and Human Services. HHS action plan to reduce racial and ethnic health disparities: a nation free of disparities in health and health care. http://minorityhealth.hhs.gov/npa/files/Plans/HHS/HHS_Plan_complete.pdf. Accessed July 6, 2014. Koh HK. A 2020 vision for healthy people. N Engl J Med. 2010;362:1653-1656. National Institute on Minority Health and Health Disparities. About NIMHD: vision & mission. www.nimhd.nih.gov/about/visionMission.html. Accessed July 6, 2014. Porter ME. A strategy for health care reform—toward a value-based system. N Engl J Med. 2009;361:109-112. LaVeist TA. Beyond dummy variables and sample selection: what health services researchers ought to know about race as a variable. Health Serv Res. 1994;29:1-16. Waldo DR. Accuracy and bias of race/ethnicity codes in the Medicare enrollment database. Health Care Financ Rev. Winter 2004-2005;26:61-72. Racial and ethnic disparities in health and healthcare among older adults, including Medicare beneficiaries, have been long-standing public health concerns in the United States. The study by Wang and colleagues in this issue of the journal is yet another reminder that the current Medicare program, specifically Medicare Part D, needs to better prioritize the unmet healthcare needs of minority populations. PATIENTS: The findings in the study by Wang and colleagues have important health implications for minority patients, particularly black and Hispanic Medicare beneficiaries with Part D coverage. Black and Hispanic patients are more likely than nonminority patients to underuse prescription medications, which are often critical for improving their health. 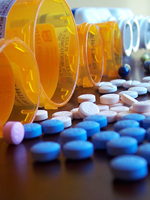 Consequently, they are also less likely to qualify for or to meet the eligibility criteria for medication therapy management (MTM), which is largely based on the number, types, and costs of medications prescribed. MTM programs have important health benefits and are often associated with improved medication adherence and health outcomes. Therefore, as the results of this study suggest, current Medicare Part D MTM programs may be perpetuating existing disparities in health status, considering that nonminority patients are more likely to be eligible for and to benefit from these programs. The current Medicare Part D MTM program requirements ignore the problem of the persistent underuse of prescription medications among chronically ill minority patients with Medicare coverage. POLICYMAKERS: This study has important implications for Medicare policy and reiterates that Medicare programs, such as MTM, should focus more on improving population health. Programs such as Medicare Part D need to target the unmet health and healthcare needs of the minority Medicare population. The current MTM program structure is poorly designed, because it disproportionately excludes the patients who are most at risk for poor health outcomes—low-income minority Medicare beneficiaries with multiple chronic conditions who are prescribed multiple medications but are often not using them. These are the patients who are less likely to adhere to prescription medications and the most likely to benefit from an MTM program. Alongside health reform efforts to improve population health and reduce health disparities through the provision of population-based healthcare, Medicare Part D should also adopt a similar mechanism in identifying MTM-eligible Medicare enrollees. Such an alternative strategy should be designed to target patients and not numbers; the number of prescription medications (from a predetermined list of eligible medications) is currently a criterion for MTM eligibility. For example, all Medicare beneficiaries with specific chronic conditions for which medications are critical in improving health outcomes should be eligible. Targeting patients with conditions that are major contributors to health disparities (eg, hypertension, diabetes, and cardiovascular disease) should also be prioritized. This population-based approach may not only improve health outcomes for minority patients but may also get us closer to reducing the gap in health outcomes between minority and nonminority older adults. Ultimately, efforts to reduce disparities in population health, whether through the implementation of MTM or the reduction of the costs of prescription medications, will result in considerable cost-savings to the US healthcare system.